This is an example of Edades’ later landscapes, showing the artist’s more fluid, gestural approach to representations as he depicts the environs of the city where he moved together with his American-born wife Jean in 1967. This is not the original painting but a production made into a greeting card. My husband got this from the staff of Women’s Journal. The actual painting shows a woman sitting on a bench (or is she standing) at the shoreline. Some of Edades’ work shows his interest in gardening and horticulture. I wonder if he was able to include a compost bin in his paintings. Edades served as Director of the College of Fine Arts and Architecture at the University of Sto. Tomas. He devoted his time painting in his garden in Davao after his retirement from the academe. He loves to listen to Chopin while doing his masterpiece. 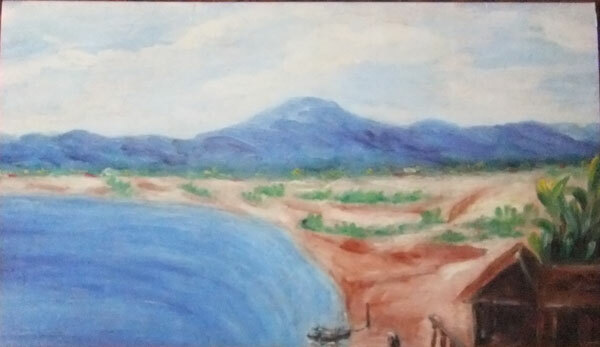 This entry was posted in Artwork and tagged davao shoreline, Victorio Edades, victorio edades art, Victorio Edades greeting card, victorio edades painting on December 23, 2011 by Yami. Sharing with you. Thanks. Could have been polished in so many ways, but it was immediately posted. Oh, well!http://edadesprojects.wordpress.com/.